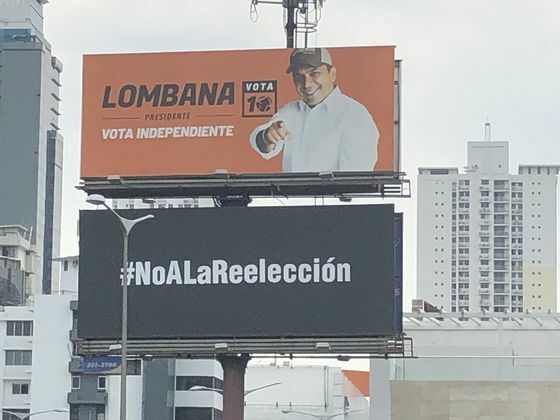 (Bloomberg) -- Step off the plane in Panama City and one of the first things you notice is the anti-establishment furor building in the country. General elections are to be held in a few weeks. But Panamanians seem to care less about who the top presidential candidates are -- there’s a lot of them -- and what their policy positions might be than they do about tossing the incumbents out of Congress. They’re fed up with the ruling class, just like folks are in Brazil and Italy and Poland and on and on. The principal causes here are similar to those found elsewhere: a sluggish economy coupled with a string of corruption scandals, including, of course, the Panama Papers. The movement first popped up a while ago on social media under the hashtag #NoALaReeleccion and has taken hold across the city since. It’s scrawled on signs held by campaign volunteers. It’s plastered on billboards. (As is the image of a rat, which has become something of a nasty symbol for embattled incumbents.) And it’s on the T-shirts donned by waitresses. Fifty of the 71 lawmakers in Panama’s unicameral legislature are seeking re-election, according to local newspaper La Prensa. Thirty-one of them have been in office for at least a decade. The president, an unpopular centrist named Juan Carlos Varela, is prohibited by law from seeking a second term. On a steamy Sunday afternoon, I ran into an elderly woman who sells coconut water out of a little shack a few miles from the Panama Canal. We chatted some and when the conversation turned to politics, she quickly became animated, giving voice, it seemed, to scores of Panamanians who are sick of the old guard and want to try their luck with a new generation of leaders. “You’re going to tell me that you’re going to do something for the country now after you did nothing all these years?” she said with a look of disgust on her face. She had just swiftly cracked open the coconut she handed me with a machete, so I certainly wasn’t going to argue with her. This whole #NoALaReeleccion thing is pretty intense. It’s no laughing matter, I quickly found out. Over lunch at a traditional spot in the San Francisco neighborhood called Jimmy, I joked, somewhat loudly, that maybe someone should start an opposing movement. They could call it “Si a La Reeleccion.” The locals at my table were mortified. They hushed me up and urged me never to utter such words in public again. Or at least, that is, until after election day -- Sunday, May 5.